I just bought a pair myself. I love my new MIA bling bling flats found on their website. My favorite things have combined.. animal print, bling and comfort. Best $69 you have ever spent. 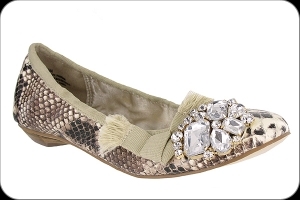 These dazzling bowed Steve Madden flats from Nordstrom are $89.95. I love these classic black flats with one large stone found as a steal on Shiekh Shoes for only $19.99. Pair these with a pencil skirt or leggings for a great look.